We already know that LinkedIn and Google+ drive very few referrals compared to their competitors. Yet it turns out the traffic they do drive, is actually quite high on the quality scale. Google+ users spend more than three minutes diving into links shared by their circles, view 2.45 pages during each visit, and bounce only 50.63 percent of the time. LinkedIn users meanwhile spend over two minutes on each link they click, view 2.23 pages with each visit, and bounce 51.28 percent of the time. On the other hand, Twitter and Facebook see similar bounce rates (56.35 percent each), pages per visit (2.15 vs 2.03), and time on site (123.10 seconds vs 127.44 seconds). Pinterest users bounce as often as Facebook users and Twitter users, but view fewer pages per visit (1.71) and spend considerably less time on site (64.67 seconds). 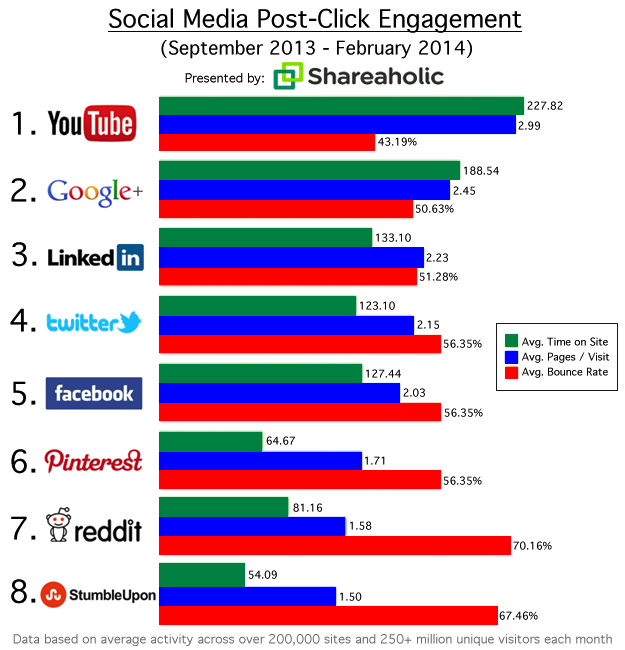 • YouTube is the undisputed champion as it drives the most engaged traffic: lowest average bounce rate (43.19 percent), highest pages per visit (2.99), and the longest visit duration (227.82 seconds). • Reddit users are the most fickle, meaning they are the most likely to abandon sites: a 70.16 percent bounce rate is nothing to ignore. We specifically excluded these three in our analysis as they didn’t seem comparable to the other sites. YouTube is all about video, which by definition is more engaging than a mix of videos, photos, and text. Reddit and StumbleUpon meanwhile are link aggregators. While they both drive massive amounts of traffic, users aren’t getting recommendations from their friends or followers, so it should surprise nobody that they’re less engaged with the resulting content.